Through over ten years of development, riding, manufacturing improvements, testing, and racing, observation, strider bikes have been able to create a type of bike (strider-12 classic bike) which allows some more successful and easy transition to the pedal bike. 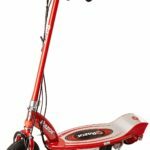 This company generally specializes in balance bikes specifically and in the process, it has been able to develop some enhance features in the process such as the lowest seat in the industry. With their 4 learn to ride steps, children of age ranging from eighteen months to three years have been in a position to get onto the bike and move when the bike is in good set up. 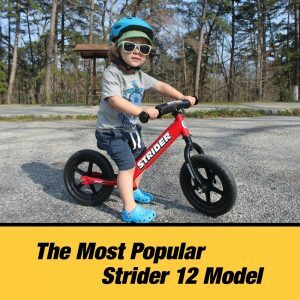 Strider-12 classic balance bike mostly inspires children to ride. The main mission of this strider company is to build some efficient, lightweight, all types of terrain bikes able to develop some two-wheel balance, confidence, and coordination. With over one million bikes sold worldwide, strider wishes to continue reaching all families worldwide. Strider-12 classic balance bike is a very simple design favorable for training young children on how to balance and steer two wheel bikes without straining. Since this type of bike does not have pedals or any other complicated form of propulsion, most young children have been able to discover that riding the balanced bike the simplest, just like walking. Children do not develop any fear while riding this bike since they can be in a position to place their feet solidly on the ground. As children progress at their own pace, they can be in a position to change to the traditional bike when ready. As the industry usually uses entry level as their shorthand for non-race bike, they give you an assertion of confidence and comfort custom grips, saddles and some other features which are able to set strider-12 classic bikes lighter and some more expensive model. This bike has been designed to inspire cyclists from the age of eighteen months to three years. They also provide a good platform to the transition from the striding to coasting. This helps the children learn how to handle and balancing skills which are important in the eventual piloting of a proper bike. The strider-12 classic bike has a sturdy frame which is rounded off with some flat-free tires, footrests for gliding, brake mounts and an adjustable seat post. This helps the young rider increase some the young rider’s coasting skills. Some rear brake can be included to help keep things in check. Strider-12 classic balance bike’s first step is to learn on how to balance the bike. It helps your child learn how to steer and balance without pedaling complexity. Once your child has mastered such skills, the transition to pedaling the bike is easy. The handlebar and the seat height are able to be adjusted to fit children of eighteen to three years or in a twelve to seventeen inseam. This 12 classic balance bike is perfect for a future upgrade of the heavy-duty tires and foot brake. For the classic-12 balance bike, the lightweight frame weighs 6.7 pounds only which makes it easy for children to stride and ride. The built-in footrests are designed to be perfect for the glide and learning on how to balance. Children can be hard on some things. With the classic-12 balance bike, it has a durable steel frame, puncture proof tires, and some all-weather seat. You do not have to be worried about maintenance and damage. The classic-12 balance bike is some durable yet simple design for the young rider’s first step in training and for the progressive gliding, striding and balancing. Your child will be in a position to completely learn to ride within a short period of time. Classic-12 balancing bikes are the smallest balance bikes on the market and can be used by kids as young as 18 months. Classic-12 bikes are well-designed geometry and provide plenty of opportunities for kids to extend and lean their legs to be able to glide and run. The foam tires of the classic-12 balance bike provide some maximum traction then no cushioning. It is not ideal for the non-paved surfaces. Now that you have been able to get the various features of the classic-12 balance bike, you are in a good position to purchase a bike of your choice based on your child’s age, size, and your personal budget.